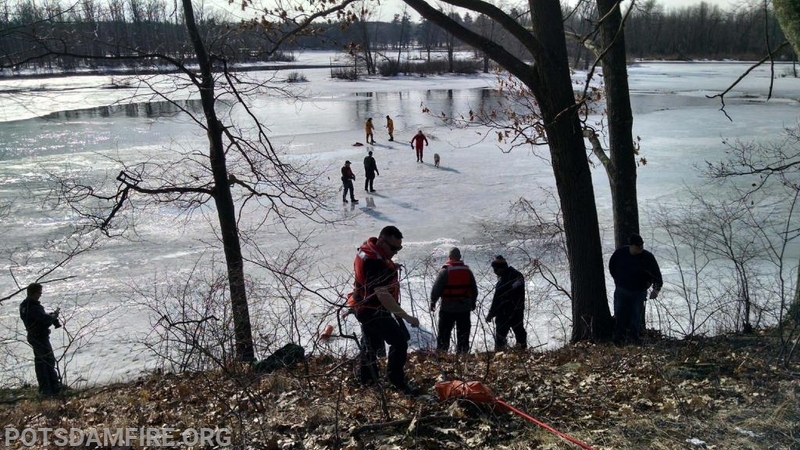 On Wednesday afternoon at 16:02 Potsdam fire was alerted to a dog through the ice, Lehman Park. 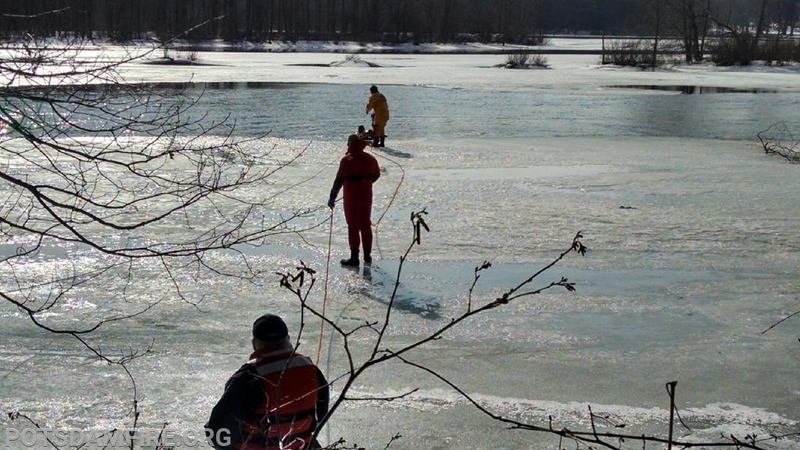 As Engine-49 is equipped with Ice Rescue gear it responded immediately to the scene along with Potsdam Police and SUNY Potsdam Police. 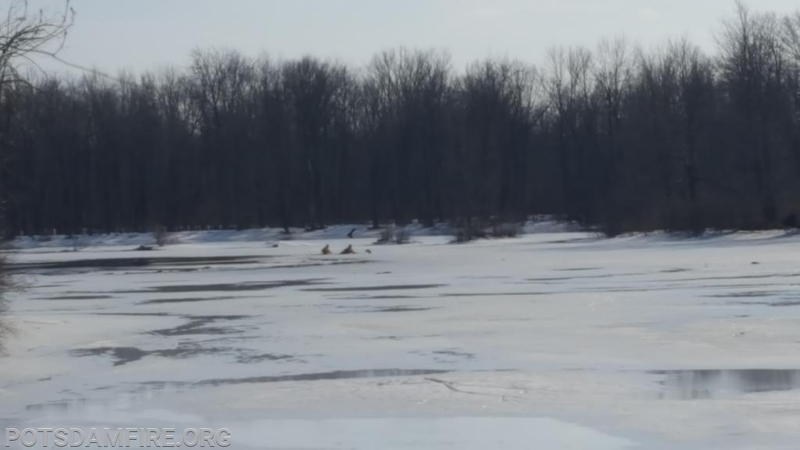 Upon arrival the dog was located and could be seen with its head and front paws above the ice. As officer Benson and firefighter Monahan were suiting up in rescue gear a rescue plan was being developed. 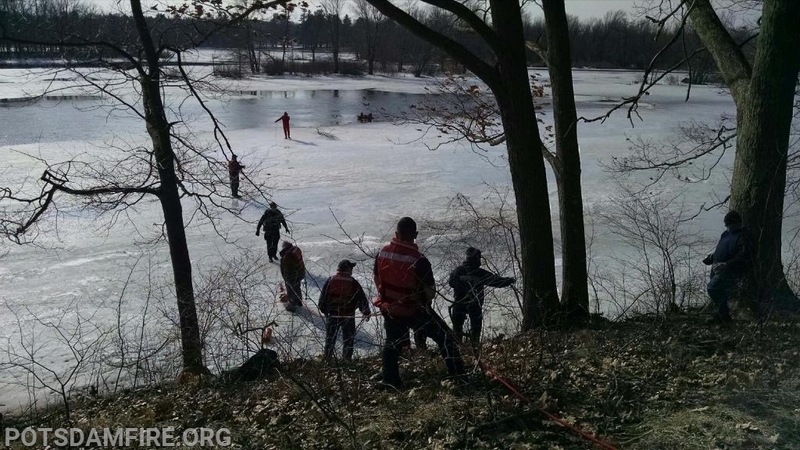 Once sufficient line handlers and safety personnel were on scene the rescuer’s entered the water and safely removed the dog back to its owner. The outcome was positive and the dog and owner were both very happy. A great job was done by all responding agencies. As spring approaches ice conditions are deteriorating every day, please keep your pets safety in mind when out walking. Use a leash. “You don’t want that dog to go out there and, God forbid, they happen to fall in,” Owens says. 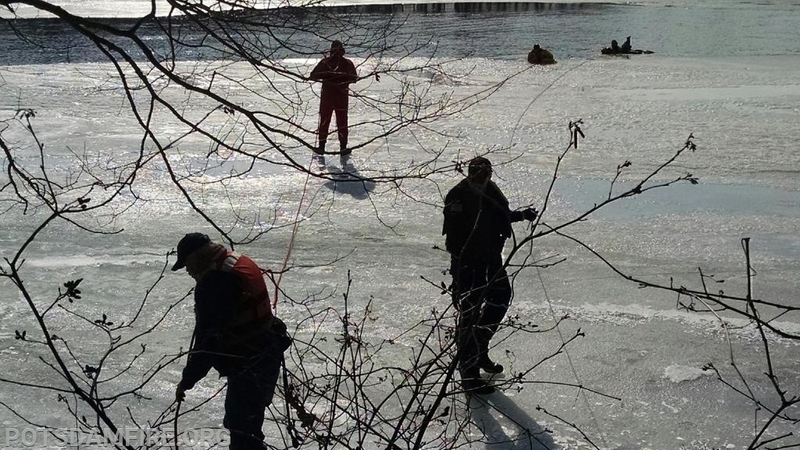 Keeping him on a leash around water will prevent him from venturing out onto the ice in the first place. Check the ice thickness. You need to see 4 inches of new, clear ice to assume it’s safe for walking. 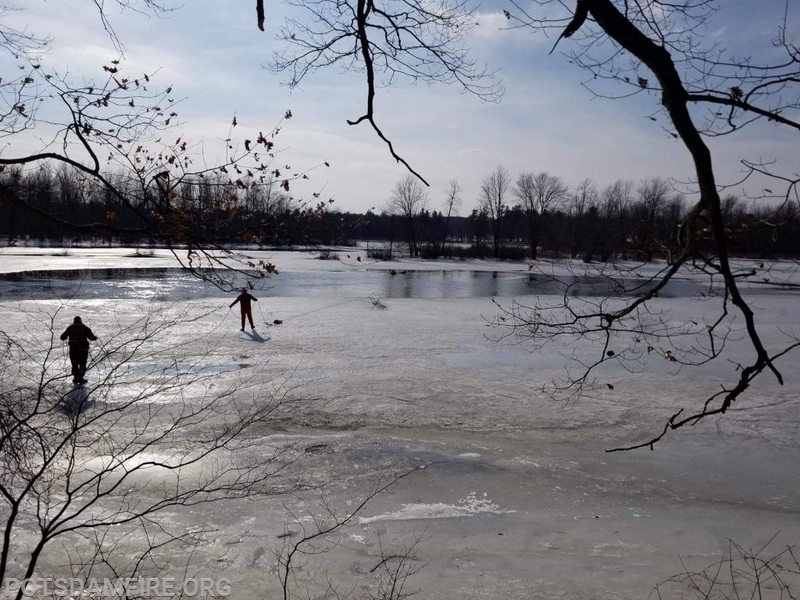 You can check it using a variety of tools, like an ice auger or a cordless drill (the Minnesota DNR has more details on how to do that). 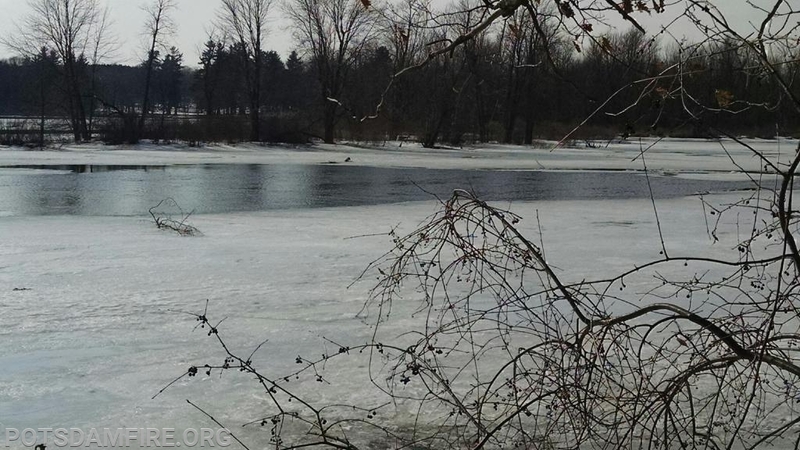 If temperatures have been above freezing for 24 consecutive hours, double those ice thickness recommendations. You also need to double this thickness if the ice is white. 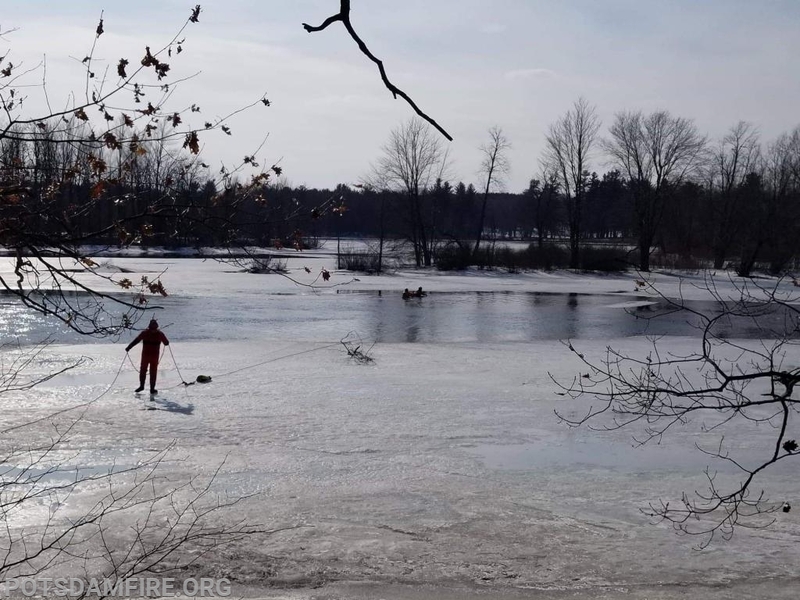 Local bait shops, resorts or police and fire departments may be able to help you with determining ice safety. Snow makes ice less safe. Owens warns that although many people assume a recent snowfall means the ice is safer, the opposite is true. The snow cover insulates the ice, and the weight of it can push down, causing cracking. Amen to all of you. You all saved one of god's creatures while risking your own. You all are heroes.